Try to plant yellow primroses in the garden and quite soon you will know if there are those sparrows around. It has not yet been realized with precision the reason why but as soon as they are sighted by these small birds, these immediately rush to peck them thus spoiling the work done by those who have planted them. Furthermore, why only the yellow ones and not the red, violet or orange? Perhaps due to the colour or their taste, the fact is that all those having flowers with that colour are unfailingly eaten or jagged. It is very likely that the diffusion of this small bird in the old times went together with the conquest of new territories by the man and when this one dedicate himself to the agriculture the sparrow did follow him making the link indissoluble. Over the centuries this small bird has maintained this bond taking advantage of all the related benefits, from the security against the natural predators, to the availability of food in all seasons. Unluckily, this promiscuity has often exceeded by both parts the limits of tolerance, leading the man on one side and the sparrow on the other towards two highly contrasting behaviours. 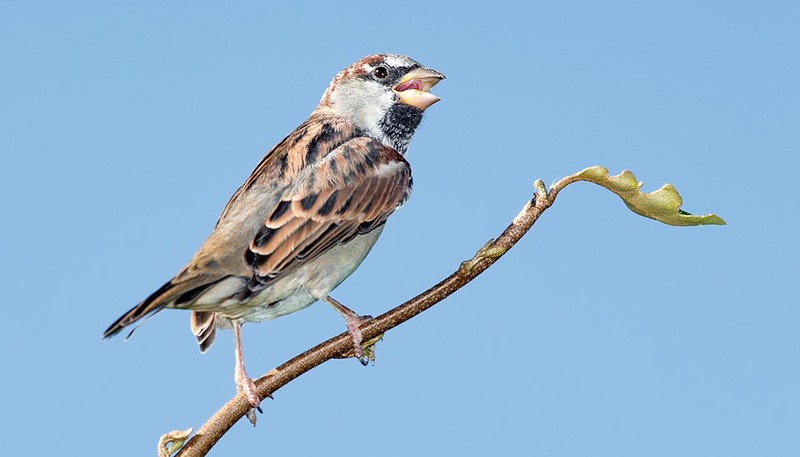 The sparrow, helped by the favourable conditions, has been able in the past to reach very consistent numbers such to jeopardize the crops of its host, causing very considerable damages to the fields of ripe cereals. In fact, the sparrow leaning on the spikes of the wheat for taking even only one grain caused the breakage of the stem that then was abandoned for leaning immediately on another one. Entire areas close to farms were so irreparably damaged. Just to remind what happened in Italy at the time of the “League of Nations Siege” or better, of the Sanctions and the World insulation imposed to Italy in 1935 by the League of Nations due to the war in Ethiopia, for some time was authorized the hunt to the sparrow also during the nidification time as the damages caused to our agriculture were immeasurable. Man, however, had been able since the previous centuries to retaliate against them in an even more subtle way. You, sparrow, eat my corn and I, man, eat your flesh. In Lombardy still now can be seen how numerous were the bird hunting sites present practically in every dairy farm or agricultural settlement. 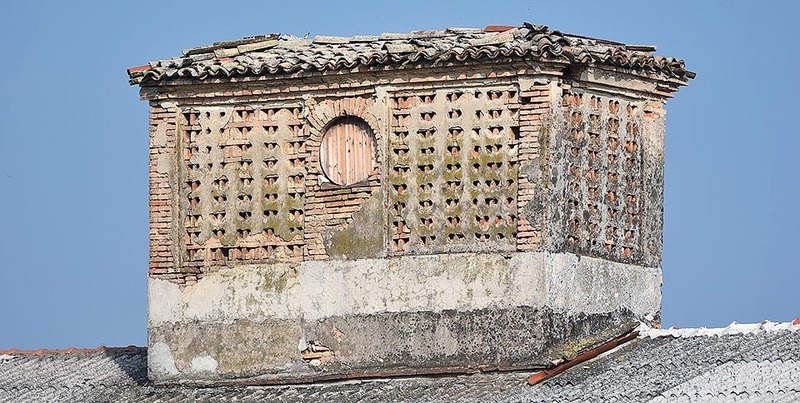 A wall of the building, avoiding that facing north, purposely holed with countless holes close each other with which the sparrow was invited to nidify. 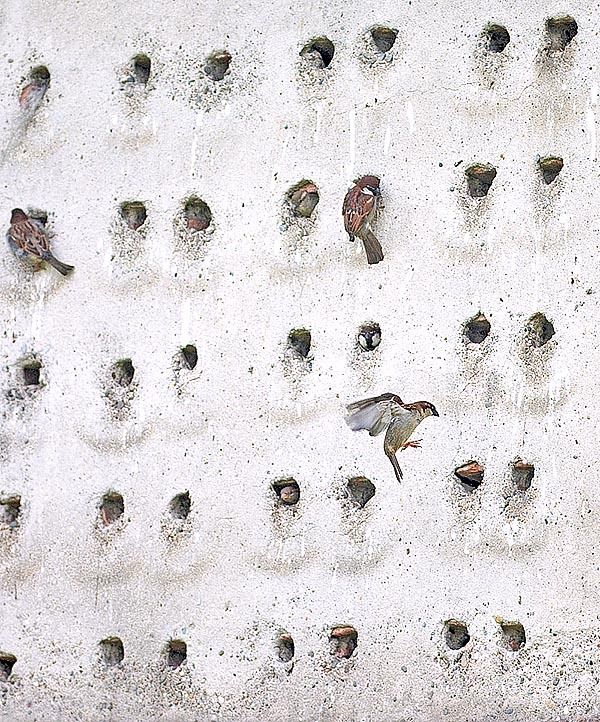 The nests could be checked from the inner side of the wall and at the right time most of the brood was taken off for eating it. Whole families and at times whole rural countries did sustain in such way. 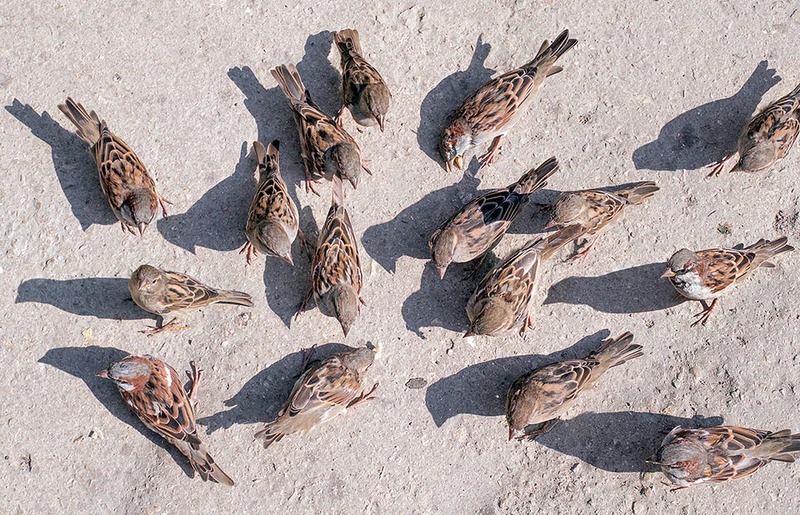 Then, suddenly, along with the drastic change suffered by the agriculture, here the sparrow has begun to loose positions day by day in a worrying way, so much to reduce itself during the last decades to alarming numbers for the survival of the species. 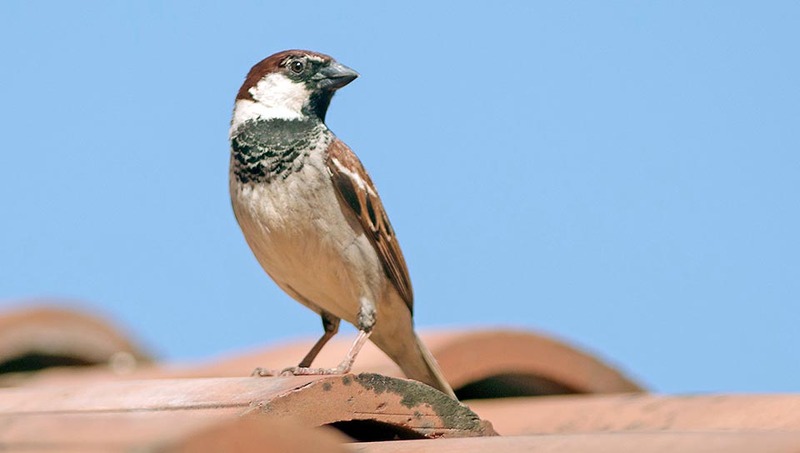 The House sparrow or Italian sparrow or simply Sparrow (Passer domesticus Linnaeus, 1758) belongs to the order of the Passeriformes and to the family of the Passeridae and has been one of the first birds to be classified in the modern scientific taxonomy. The etymology of the scientific name is quite simple : Passer from the Latin homonymous term for the sparrow and domesticus = domestic. 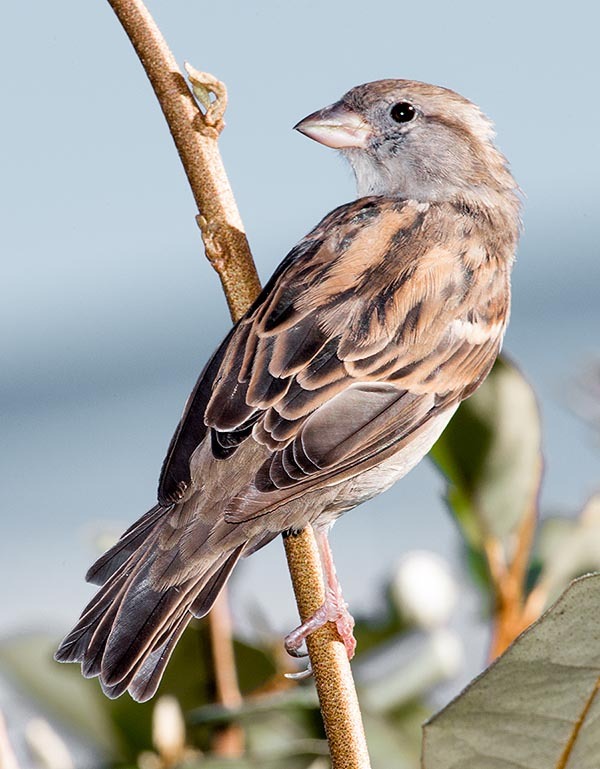 Other common names are: House Sparrow in English, Haussperling in German, Gorrión in Spanish, Moineau in French, Pardal-comum in Portuguese, Passero domestico, Passero oltremontano, Passera in Italian. The house sparrow is surely one of the most diffused birds on our planet. Formerly native to Middle East and Europe, it has been able to conquer new territories following the human being and his agricultural activities. From the Palearctic that it has amply conquered, has progressively widened its range to all continents through direct introduction made by man as well as through accidental placing perhaps also through means of transport in particular ships on which it often did nidify. Nowadays, it totally occupies Europe, Central and North America, South America excluding the Amazon forest, South Africa and the Horn of Africa, Eastern Australia and New Zealand and Asia, excluding the extreme Far East, of China and Indonesia. In the places where it has been introduced it has immediately shown its impetuosity and ability to conquer new territories and has become at once an often unwanted alien. The boldness in the relations with the human being, the versatility in feeding, the ability to adapt to any environment and the considerable prolificacy have facilitated indescribably the settlement of this small bird in any location it would be. It has been able not only to conquer its space in an environment fashioned by millennia of natural selection but has also menaced the present species taking their habitat and disturbing their modalities of life. Typical example of many alien species introduced for various reasons in remote locations and then immediately pointed out as thoughtless and reckless manoeuvres. Two typical instances: the Mynah (Acridotheres tristis) in Australia, the Coypu (Myocastor coypus) in Italy and the Red swamp crayfish in Europe (Procambarus clarkii). 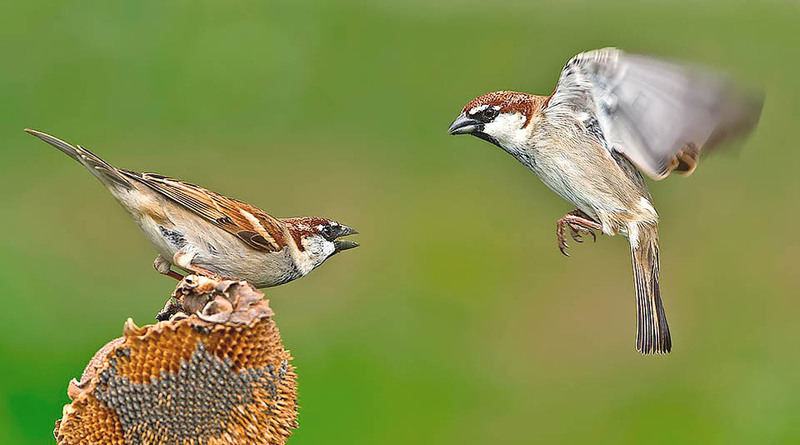 The house sparrow is a sedentary species and most of the populations spend the whole life without getting away even of a few kilometers from the birth place. An environment typical for this bird does not exist. For this species is essential the human presence and his activities, regardless of where you are, of the environmental situations present and of the weather conditions to which the area is submitted. It does not live in the northernmost tundras, in the dense tropical forests, the very large deserts and the tops of the mountains, environments that, anyway, do not allow, if not rarely, the presence of the human beings themselves. It frequents preferably cultivated agricultural areas, the farmsteads and the farms with animals, intensive breedings, zones with industrial sheds, city parks and public gardens and any other area where it thinks to find a site for nidifying and having food the whole year round. Although being a bird that does not fear the human being, it has in the same time a very cautious and prudent behaviour and this characteristic has surely helped in protecting itself from the presence of those house pets, friends of the man but in the same time its very implacable predators. The domestic cat stands in fact among its fiercest enemies, animal to whom it has since ever paid a heavy tribute. The house sparrow is not a very showy bird having a livery that in the female is absolutely insignificant and without any characteristic worthy to be noted. It is practically greyish brown on the lower part of the body and slightly more pronounced and streaked brown, on the alar cover. Also the young do have the same livery. Conversely, the male is of a more pronunced brown hazelnut colour, marked by black drops and by a white stripe crossing horizontally the wings on the primary coverts. The head has a hood of the same colour that starting from the ocular line connects on the nape with the alar cover. On the contrary, the top of the head is grey ash, characteristic that, as we shall see, distinguishes it from the subspecies Passer domesticus italiae, typical to the Italian territory. The cheeks are whitish, even candid during the nidification time and on the throat has a more or less extended black spot that elongates on the chest. The tail is moderately pronounced and of brownish colour. The legs are of flesh colour and the bill, conical and robust, is black in the male and bluish grey in the female. A considerable number of subspecies has been classified, some of them are now placed at level of species but the situation is continuously evolving and still now we assist to continuous taxonomical updatings. 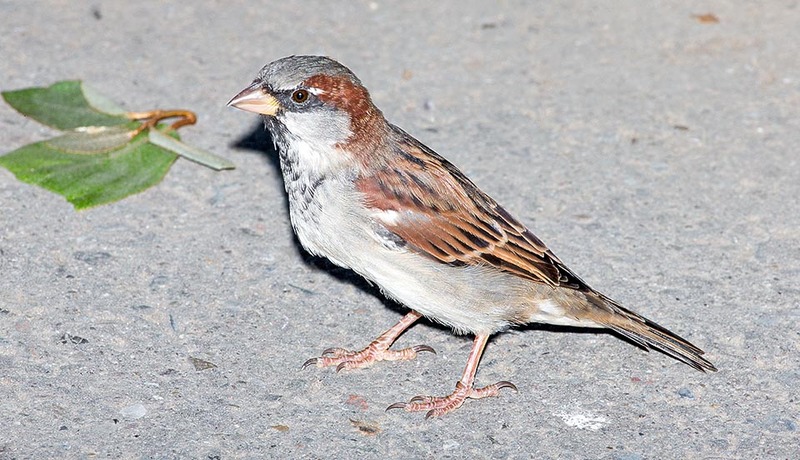 In Italy, the house sparrow has three congeners quite similar each other and two of them widely overlap their territories. Autochthonous to Italy is the subspecies Passer domesticus italiae, characterized by the hood of hazelnut brown colour instead of grey as the type species. This occupies all the national territory and has the contact point with the species typical of the extreme northern part of Italy in correspondence with the watershed of the Alps, from the Ligurian coastline to the Triestine Karst. 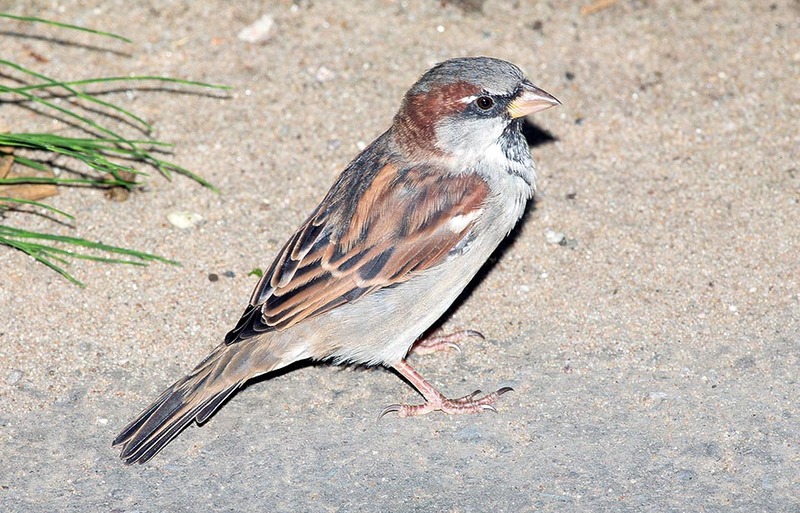 In the peninsular and insular part the Italian sparrow shares the area with the Spanish sparrow (Passer hispanicus) that evidences a pectoral black spot very marked and with streaks of the same colour quite evident on the sides. Finally, is present the Eurasian tree sparrow (Passer montanus), the smallest among the four species, the less anthropized and the easiest to identify for the size as well as for the behaviour. The house sparrow is about 17 cm long, has a wingspan of 25 cm and weighs more than 30 g.
Our house sparrow nidifies in any place provided that the same has the characteristics of a more or less comfortable hole with a shelter and the capacity to contain the numerous progeny. By every reproductive season is added a new and unthinkable site where is found a nest of this small bird. We have gone from oddities of the type inside a traffic light to a more normal choice of an old swallow nest, from the depths of a coal mine, to the inside of a shell of a stork’s nest. However, it does not fail to build it in a hole dug on an embankment, woven between the electrical wires, in the pipe of an exhaust system of a kitchen, in the street lamps or inside a carcass of a car. 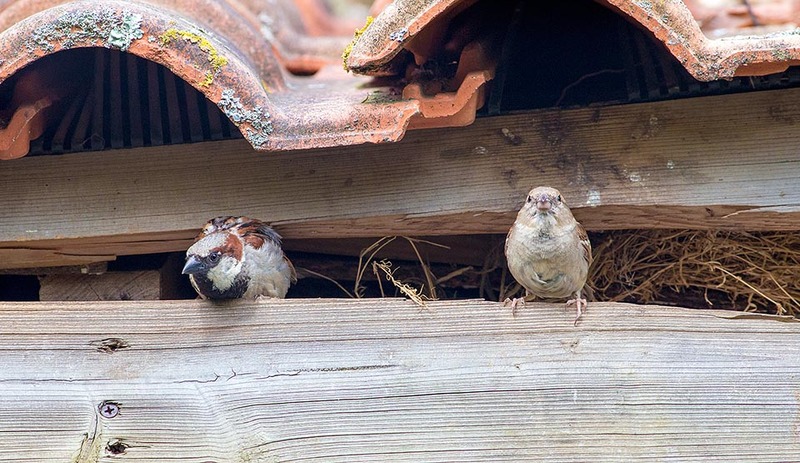 Apart from these oddities now customary, the sparrow usually places its nest under the house tiles, in the crevices of the walls, in the barns, in the nest boxes, in the gutters interstices, in the industrial sheds and rarely in the trunks of the trees. With this spirit of adaptation it is clear that it is a winner in whatever environment it is. 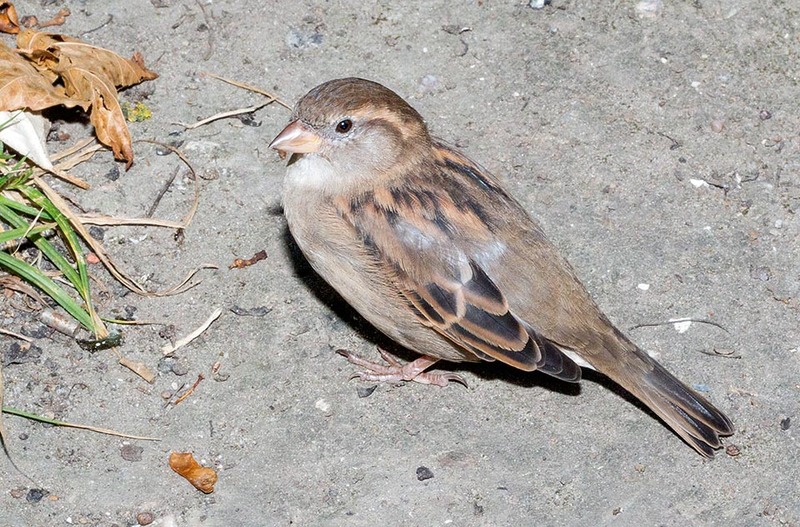 The sparrow is monogamous for the whole season of nidification and, though territorial, limits to defend a very reduced part of its territory being a very social species that coexists with its similars also during the nesting period. It is so even more outside this time, when it gathers in flocks once very numerous, looking for food but also during the night in their very noisy dorms. 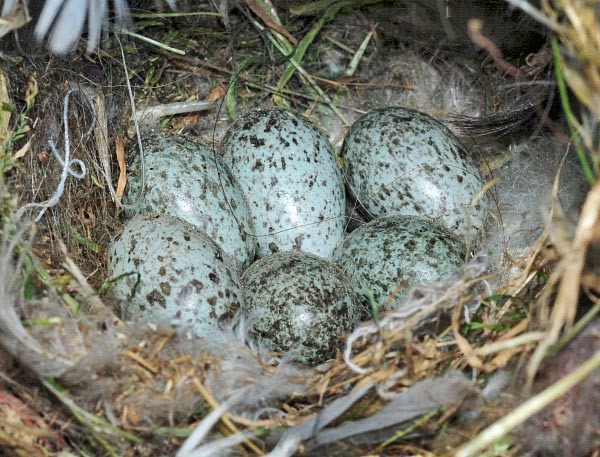 The nest is built with dry grass and straw, egg-shaped with lateral opening and made inside soft with other birds feathers, wool and animal hairs. It lays averagely 5-6 greyish white eggs strongly dotted of black that are brooded by both partners for a very short period going from 11 to 15 days. The chicks, who come to life blind and featherless, will stay in the nest for 2/3 weeks more and will depend from the parents for some ten days more. In some seasons and when the availability of food abounds, the sparrow is very prolific and may lay even more than three times per year. Granivorous for most of the year, becomes insectivorous while breeding the offspring and even frugivorous during the bad season. It is known, then its habit of scampering on the doorstep or between the tables of a bar, looking for crumbs and leftovers it tries to conquer struggling with the inevitable and invasive Feral pigeons (Columba livia). The species has undergone in the recent decades a drastic and generalized decrease due to still now unclear reasons, but surely linked also with the changes of the agriculture and to the diffused utilization of the pesticides. The disappearance of stable meadows with their essences and of the relevant microfauna, by sure has had a negative effect on the existing populations that had reached in the 70’s their apex. The species is still now suffering in all Palearctic populations however due to the vastity of the occupied territories and the still high overall number, is not considered as an endangered species. Lately it has been noted a significant recovery in all the European populations. It has been observed that in the countries of the Padanian Valley, the re-use of old hunting sites previously abandoned, has led in short time to the creation of new population nuclei that are consolidating through the time. It is however decisive and often essential the fact that these sites are placed in an inhabited location as proof of the indissoluble link with the human being. A curiosity. The sparrow is a bird who dedicates a lot of time to clean its own body and stands among the few that exploit different ways for keeping the plumage at the maximum efficiency. It is often seen rummaging and shaking off the dust on the ground among clouds of dust in the famous “dust bathings” tipical of the galliforms but at the same time making real dives in water in the puddles and in the city fountains. 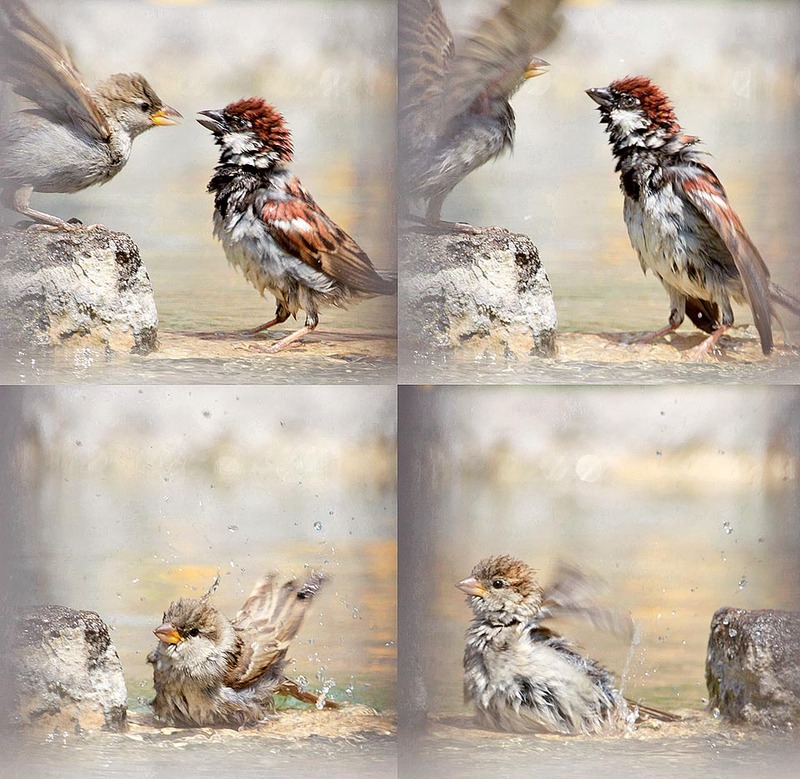 Finally, it does not forget to do the “sun bathings” in order to disinfect the feathers. A real lover of cleanliness mindful of the fact that its most fearsome enemies are the mites, the fleas and, generally, the mallophagous insects that often attack and destroy its broods. Here is an anecdote that concerns the impossibility shown by the sparrow of walking when on the ground. All begins from Jesus’ crucifixion, already object of legends that in Spain justify the red spot on the chest of the Swallow(Hirundo rustica) and in England on that the Robin (Erithacus rubecula) because it had snatched a spine of the crown placed on the head of the condemned man, getting stained with his blood. In Russia they say that a little bird, for spite, rightly the sparrow, has put them back in place. As a punishment, the legs were bound together and so the sparrow when on the ground, cannot do anything else than to leap with both feet together for moving.